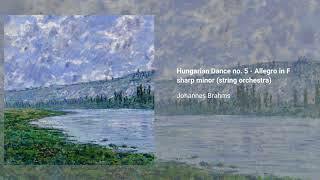 The Hungarian Dances (Ungarische Tänze) by Johannes Brahms, are a set of 21 lively dance tunes based mostly on Hungarian themes, completed in 1869. They are among Brahms's most popular works, and were certainly the most profitable for him, as each dance has been arranged for a wide variety of instruments and ensembles. Brahms originally wrote the version for piano four-hands and later arranged the first 10 dances for solo piano. Only numbers 11, 14 and 16 are entirely original compositions. The most famous dance is no. 5, but even this dance was based on "Bártfai emlék" by Béla Kéler, which Brahms mistook for a traditional song.